Sermon: What Shall You Do with Jesus? 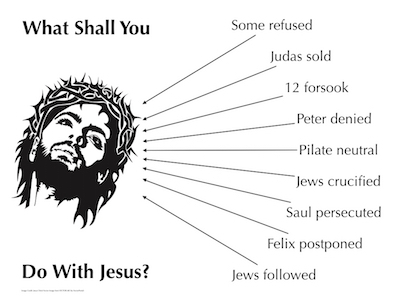 What Shall You Do with Jesus? Did you know that everyone has to make a decision about Jesus? what they shall do with Him. Even ignoring Him or the subject is a decision. one of these may describe you. 65 And He said, “Therefore I have said to you that no one can come to Me unless it has been granted to him by My Father.” 66 From that time many of His disciples went back and walked with Him no more (John 6.65–66). People do not like “hard” or “demanding” sayings. 14 Then one of the twelve, called Judas Iscariot, went to the chief priests 15 and said, “What are you willing to give me if I deliver Him to you?” And they counted out to him thirty pieces of silver. 16 So from that time he sought opportunity to betray Him (Matt 26.14–16). He used Jesus, but did not to be used by Jesus. 56 But all this was done that the Scriptures of the prophets might be fulfilled.” Then all the disciples forsook Him and fled (Matt 26.56). 72 A second time the rooster crowed. Then Peter called to mind the word that Jesus had said to him, “Before the rooster crows twice, you will deny Me three times.” And when he thought about it, he wept (Mark 14.72). 33 Do not be deceived: “Evil company corrupts good habits” (1Co 15.33). 24 When Pilate saw that he could not prevail at all, but rather that a tumult was rising, he took water and washed his hands before the multitude, saying, “I am innocent of the blood of this just Person. You see to it” (Matt 27.24). 23 Then the governor said, “Why, what evil has He done?” But they cried out all the more, saying, “Let Him be crucified!” (Matt 27.23). 1 Then Saul, still breathing threats and murder against the disciples of the Lord, went to the high priest 2 and asked letters from him to the synagogues of Damascus, so that if he found any who were of the Way, whether men or women, he might bring them bound to Jerusalem. 3 As he journeyed he came near Damascus, and suddenly a light shone around him from heaven. 4 Then he fell to the ground, and heard a voice saying to him, “Saul, Saul, why are you persecuting Me?” 5 And he said, “Who are You, Lord?” Then the Lord said, “I am Jesus, whom you are persecuting. It is hard for you to kick against the goads” (Acts 9.1–5). 25 Now as he reasoned about righteousness, self-control, and the judgment to come, Felix was afraid and answered, “Go away for now; when I have a convenient time I will call for you” (Acts 24.25). 38 Then Peter said to them, “Repent, and let every one of you be baptized in the name of Jesus Christ for the remission of sins; and you shall receive the gift of the Holy Spirit” (Acts 2.38). Your eternity depends upon your answer.